50, 60, 70 lbs. 25" - 31.25" 7"
How To Choose Arrows 330 FPS 80% 34" / 4.1 lbs. Welcome to our Martin Pantera Magnum review. 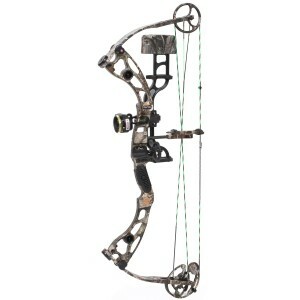 This is probably the finest compound bow in this price range Martin has ever designed. An easy-to-tune eccentric system and more than enough kinetic energy potential to take down any game animal, given the right bow settings. Quiet and almost vibration-free. A narrow valley but a very solid wall – and both can be slightly adjusted directly via the cam system. Recommended for intermediates and advanced shooters, though beginners determined to learn solid technique will definitely not be disappointed either. Is It Hard To Assemble The Martin Pantera? I get asked this a lot by beginners wanting to make a purchase. The Martin Pantera Magnum comes fully assembled, with cables and string installed. All you need to do is attach the arrow quiver using the quick-connect system and you’re ready to go. The idler wheel and power come are both beautiful in design and quiet, and come with Martin’s Precision Speed Bearings that significantly reduce friction over the years. The Pantera comes with a HammerHead string, which is considered to be one of the finest mass-produced archery strings on the market. HammerHead strings are pre-stretched to avoid “setting in” during shooting, reduce peep sight rotation, and significantly reduce serving separation. The end result is a string that’s as consistent on the first shot as it is 300 arrows later. In a real-life situation however, your speed is likely to be much lower than this (although still more powerful than people realize). To understand this better, see: What’s your bow’s REAL speed?. The kinetic energy of the Pantera will depend largely on your bow’s setting. If you use the maximum settings of 70 lbs. draw and 31″ draw length, expect around 76 to 82 ft-lbs of KE at point blank range, depending on the weight of accessories installed on your string and the length / type of vanes of your arrows. Using similar bow settings, a 450 grain arrow would deliver approximately 78 to 85 ft-lbs (again at point blank range). To put things into perspective, if you were to get a Pantera with 60 lbs. draw weight and set a 28″ brace height, a 450 grain arrow would carry less than 62 ft-lbs of KE. This is still, however, more energy than most hunters will ever need (see section below on Hunting). Note: kinetic energy of the Martin Pantera will deteriorate at a rate of approximately 1.8 ft-lbs for every 10 yd of arrow flight. So in our last example (60 lbs. draw weight / 28″ brace height), a 450 grain arrow impacting a 40 yard target would deliver around 55 ft-lbs of KE. The Martin Pantera draws relatively aggressively, with a rather quick ramp up to peak draw weight. This is normal and to be expected from any compound bow with an IBO speed of over 320 FPS, as the aggressiveness is required for maximizing energy storage in the limbs. Just because it’s aggressive however doesn’t mean it’s harsh – the draw is actually extremely smooth. Right before end of the draw cycle there is a very slight hump that can be felt, but it’s nothing you won’t get used to extremely quickly nor will it negatively impact your experience. The backwall is very stable and easy to hold against, though the valley is quite narrow even after its tuned through the cam system. As a result, the Martin Pentera is a compound bow mostly for those who don’t mind shooting from the wall, though shooting from the valley is definitely possible if you have enough control and good technique. A string suppressor will eliminate string vibration upon release of the arrow. It “catches” the string and prevents it from moving any more than it needs to. The suppressor is made from carbon fiber, providing for a lot more cushioning and durability than other STS accessories. PowerTough limbs, which are installed on the Pantera, disperse energy accumulated within them across a much larger area, minimizing vibration and hence noise as well. The Silencing Arrow Shelf on the Martin Pantera also reduces excess noise generated as a result of arrow acceleration or a fall-away arrow rest. The Vibration Vortex VEM. Very light-weight dampeners that are installed into the riser at different locations to help disperse excess energy. This technology has been patended by Martin and it’s one of the most effective vibration-reducing solutions I’ve ever seen on a compound bow. The design of the riser itself also contributes towards reducing vibration, especially in the handle. If you refer back to the Kinetic Energy section above, you’ll see that the Martin Pantera at its highest settings delivers more than enough energy to take down any game animal on earth. If using lower-than-maximum settings (60 lbs., 28″ draw), a 400 to 450 grain arrow will still pierce an elk or a black bear. I’d say it’s more than worth its money. The riser is machined from a solider aluminum block, and it’s quite a bit longer than other risers found on Martin bows. As a result, the Pantera is more than suitable for both hunting and target practice. The parallel PowerTough™ limbs included are exceptionally durable and attach to the riser via heavy-duty forks. The limbs are fitted using Martin’s ROTO cups, which almost eliminate lateral and forward movement of the limbs – this really increases accuracy and reduces vibration and noise as well. Martin also included their trademark Quick-Lock mount, used for quickly attaching and removing a bow stabilizer with very little effort and without the need for any tools. I can honestly say it’s the most dependable quick-detach quiver system I’ve ever seen on a compound bow. Finally, there’s the Saddleback Thermal grip that is covered with soft leather. The design of the grip is sleek and shaped in a way that’s perfect for medium to large-sized hands, although a smaller palm should have no problem comfortably holding the bow either. Thermal technology keeps my bow hand arm, which is very useful when hunting during a cold night. Thanks for reading our Martin Pantera review. The length of this bow makes it great for target practice, while the high FPS and kinetic energy potential make for a superior hunting weapon. Excellent vibration reduction design, a very comfortable grip, and possibly the most easily adjustable cam system out there. See Cabela's current price and customer reviews on the Martin Pantera.